In May 2016, industry maverick Jim Blaine announced his retirement from State Employees’ Credit Union. His successor, longtime SECU executive Mike Lord, was named soon after. In this ongoing series, CreditUnions.com details Blaine’s history with the credit union and the movement, how SECU arrived at a successor, and what’s next under Lord for the $30 billion institution. Jim Blaine, CEO of State Employees' Credit Union, will retire after more than four decades with the credit union. Scroll through the timeline below to see SECU milestones and read more about the succession of Jim Blaine. Nation's biggest state-chartered credit union must plot course for the future without its iconic CEO. 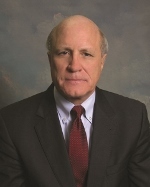 After more than 35 years leading State Employees’ Credit Union ($33.3B, Raleigh, NC), industry heavyweight Jim Blaine announced his retirement in May 2016. 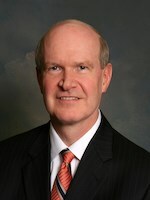 Blaine has served as the CEO of SECU since 1979 and has worked for the North Carolina cooperative for 45 years. His successor, veteran CFO Mike Lord, takes over on Sept. 1. How’d SECU do it? And how does the nation’s second-largest credit union move on without its vocal front man? Through a series of interviews with CreditUnions.com, Blaine and Lord and their colleagues will explore the process of tapping the next in line, looking back to the succession planning that preceded Blaine's departure and forward through the strategic thinking that informs the road ahead. What can you learn from the team at SECU? Click here for a listing of best practice articles, Q&As, first person commentaries, and more. The process of replacing Jim Blaine at State Employees’ Credit Union ($33.3B, Raleigh, NC) will reflect the philosophy that has driven its ascension to its long-held spot as the nation’s second-largest credit union. Blaine has been at SECU’s helm since 1979, six years after he was hired on as a loan officer. He now says he plans to retire 60 to 90 days after the North Carolina cooperative names a successor, an event he says will coincide with the end of the big credit union’s fiscal year on June 30 — either this year or next, depending on when the board makes its choice. Blaine has built a reputation across the industry for going it alone, including defying the NCUA about CAMEL scores in a dispute that resulted in regulators imposing dual examinations on state-chartered credit unions there, as well as leaving and re-joining CUNA over dual membership and other issues. But his most permanent legacy might well be leading his organization during a growth period in which SECU went from $300 million to more than $33 billion in assets. Its 256 branches now include at least one in each of the Tarheel State’s 100 counties and SECU now has more than 2 million members. But Blaine wants the world to know growth for growth’s sake is not in SECU’s DNA, and that’s in a state where national banking was born. After all, Charlotte is the home base for Bank of America, once NationsBank, once NCNB. Sticking to the idea that people want to bank local, SECU has defied conventional wisdom about the death of branching, building out its network while adding the requisite electronic services that were supposed to doom those brick-and-mortar edifices. Many of those branches also now include call centers that provide local jobs while providing internal capacity for remote service delivery if branches indeed do lose their luster. That includes helping build strong communities — and thus community relationships — through such endeavors as the teacher housing and hospice centers the SECU Foundation finances, backed by donations at $1 each month from checking accounts that belong to members who think this is all a good idea. It’s an opt-in and the vast majority of members opt to. “The banking industry is negative about credit unions not supporting local communities," Blaine says. "Politically, this is a way to counteract that, but it’s good advertising, too, to show local support. That’s tremendously important to people here in North Carolina. Our members love it and are proud to be associated with us." SECU’s outreach also includes one of the largest VITA programs in the country, but it does not include paid advertising nor other marketing staples such as sports team sponsorships. And it never has. Its membership eligibility requirements are simple: state and university employees and those whose employers are subject to the State Personnel Act. And their families. Keeping the focus in-state extends to the CEO search process itself. SECU hired an in-state management consultant to do that work. SECU is using Matthews, Young Management Consulting to help it find its next CEO. Find your next partner in the Callahan & Associates online Buyer's Guide. "Do The Right Thing" is mantra made material at nation's second-largest credit union. 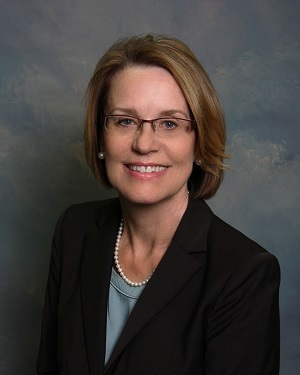 The new CEO at State Employees’ Credit Union will be charged with maintaining a culture that has guided its growth into the second-largest credit union in the country while staying old school in a lot of ways. Longtime head man Jim Blaine plans to retire soon after a successor is named, leaving behind a credit union he joined as a loan officer in 1973 and where he assumed the helm in 1979. During that time the credit union grew from $300 million to more than $33 billion, and it now has more than 250 branches and 2 million members. In this second of a series of articles that will follow the succession process at SECU, Blaine provides a quick look at a list of 10 such eccentricities that he says makes SECU “uniquely different.” While SECU’s service to its state includes accomplishments such as a thriving foundation that has funded the construction of hospices, teacher housing, and the like across North Carolina, as well as providing employment and brick-and-mortar investment in ways that others might eschew, Blaine says his playbook isn’t a “feel good” story. No, Blaine says, “We all know the difference between right and wrong.” Doing the right thing means putting member interests first, period. A prime example: Avoiding pay incentives, which can naturally tempt a staffer to see that first and what the member really needs second. Elder abuse, in fact, is a pet peeve at SECU. Institutionally, the credit union has been active in urging state lawmakers to create “safe harbors” for financial services providers to report suspected problems. On a more personal level, Blaine says, his staff sees such exploitation show up in their lobbies. Instead, SECU’s twice-a-year board retreats instead focus more on the moment, about what they can see coming up. “Did we all know Brexit would happen? Did we all know Donald Trump would be the nominee? Long-range planning is just not that realistic,” Blaine argues. “None of our members rush out to pay more for financial services,” Blaine says. “At the end of the day we need to be the low-cost provider.” That’s ongoing. 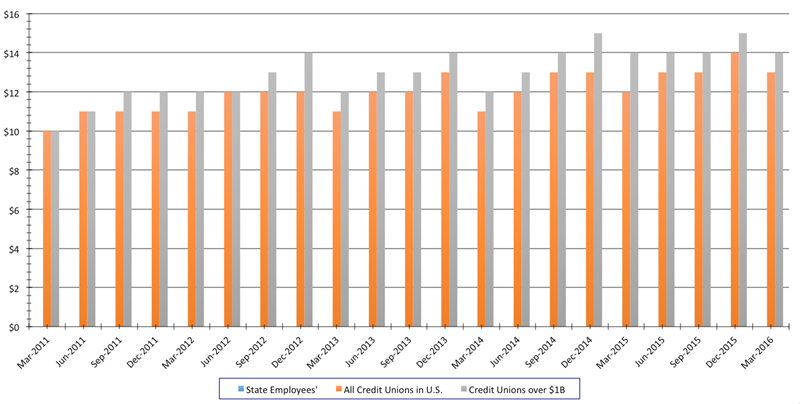 The numbers bear it out: According to Callahan & Associates data, SECU had an operating expense/average assets ratio of 1.94% in the first quarter of 2016, compared with 2.74% for the average billion-dollar credit union. Why spend existing members’ money to get more? SECU’s marketing is word of mouth. The big credit union doesn’t advertise. Instead, SECU relies on member service, and on member referrals and the goodwill it has built through the multitude of projects and programs backed by its SECU Foundation, itself funded by voluntary $1-a-month checking account checkoffs by millions of SECU members. 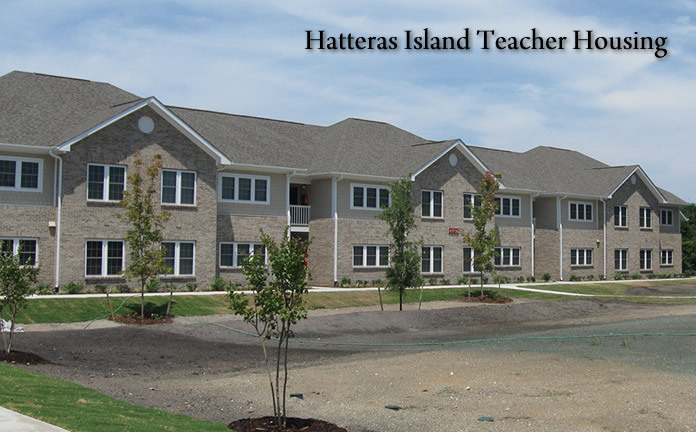 Hatteras Island teacher housing is just one of multiple projects the SECU Foundation has funded with local partners, in this case the Dare Education Foundation on the Outer Banks. The fewer levels of management the better, Blaine says. “Ours is kind of the ‘Kansas pancake model.’” For instance, about 50 of the managers at SECU’s 256 branches are senior vice presidents who supervise about five others. He also says that if the title moves, the person doesn’t. If one of those SVPs move on, the next person up stays where she or he is while assuming the added responsibilities. That’s because the ultimate responsibility, Blaine says, is to the local community, where branch managers often hold one of the most important jobs in town. We don’t train people, we indoctrinate them. The first thing we do is explain our culture, mission, and values. If they buy into that, we can teach them everything else. And if they don’t, no amount of training will change that. Most of SECU’s hires are entry level and promoting from within predominates. Even with a workforce that now numbers about 5,700, Blaine says, he personally talked to every new hire up until the past three or four years. “It was the most important thing I did,” he says. Quicker, better, or cheaper. “If you can’t do a product or service by one of those measurements, you’re wasting your time,” Blaine says. He also says that SECU looks for where it can compete against the likes of home state giant Bank of America without going head-on. “If you do, you lose,” he said. Instead, SECU has found it can be successful by investing in branch after branch and the people inside them who serve their own home community and the people who live there. “We’re local, local, local on everything,” Blaine says. That doesn’t mean not offering the requisite mobile services, but it does provide a unique opportunity that has been built up over the years. “You can come into this state with wireless and the latest ATMs, but you can’t come in and put in branches and boots on the ground. That takes a whole lot of money and a whole lot of time,” he says. Make sense of deposit data for individual branches, institutions, and entire markets. With BranchAnalyzer, the ability to make smart tweaks to your branching strategy is just a click away. “We don’t have one. We don’t believe in it,” Blaine says. There are no goals, no incentives. SECU does offer insurance and investment products, but there are no goals, no incentives. Instead, for instance, there are 2,200 staffers licensed to sell insurance and “more CFPs than Wells Fargo has in our state,” Blaine says, and each is evaluated by peers based on service not sales. The products are simple — one checking account, one loan rate, no risk pricing, and the premium is on what’s best for the member, not what grows sales. “If you provide excellent service, people will tell other people, and your growth is unlimited,” Blaine says. SECU stays inside to replace 37-year CEO Jim Blaine with longtime CFO Mike Lord. Jim Blaine doesn’t call the CEO’s office his own. Mike Lord, selected last week to take the helm of State Employees’ Credit Union ($33.3B, Raleigh, NC), will simply be moving into “the space I sit in now,” Blaine says. Blaine means that literally. He says he’s abandoning his office this week to make room for his newly announced successor, who officially takes over on Sept. 1. Blaine says he was prepared to stay for a year but instead was given 60 days to clear out after 37 years in the top job at the institution he joined in 1973. Mike Lord will officially take over as President and CEO of SECU on Sept. 1. “You don’t need two bosses hanging around,” he says. That philosophy permeates the sprawling organization, where a flat organization chart, simple product lineup, and staffers indoctrinated to serve instead of incented to earn, has helped SECU become the nation’s second-largest credit union. “We try to operate like 256 small credit unions,” Lord says, noting that in his own case, he’s working on the same site — although a newer building — where he began his SECU career. He’s been senior vice president of finance and administration/comptroller/CFO since 1986 — all variations on the same theme, he says of his evolving titles — and says he long ago “drank the Kool Aid” that makes SECU a different animal than many of its peers. Driving those differences is an atypically long-tenured workforce, many of whom came aboard right out of college — young and impressionable, Blaine would say — like Lord himself was when he was hired as a loan officer 41 years ago. Projects underway include a new data center that will itself support a new loan-origination system and ATM network. That all will be part of a new process called “Convergence” in which a unified communication system provides local contacts whenever possible for every caller and emailer. SECU's headquarters sits on the same site where Mike Lord began his SECU career in 1975 in the former corporate offices built in 1962. “We’re in-sourcing while everyone else seems to be outsourcing,” Lord says. That’s in addition to helping guide the growth of the credit union’s subsidiaries, including an in-house insurance company, property management operation, and investment arm. Befitting SECU’s credo of service before growth and profits, the latter specializes in low-cost index funds from Vanguard, and the insurance company boasts more than 2,000 licensed agents in the form of multi-tasking branch employees. SECU also has one checking account, one savings account, one credit card, and offers the same loan rates to members regardless of relationship or credit score. There also are no sales incentives. Mike Lord spoke with CUbroadcast about his new position, leadership, Jim Blaine, and the state of the industry today. Lord knows he has big shoes to fill, not just in his own shop but across the movement. “Jim’s been the soul of our credit union in making sure the culture is there to keep the focus on our members and addressing and meeting their needs,” the new CEO says. “But he’s also an industry leader who pokes and prods and directs attention, often to some — as Mr. Al Gore might say — inconvenient truths. And what does the 66-year-old Blaine plan to do now? “Absolutely what I want to,” he says. SECU's board chair says self-examination across the enterprise, including the board, led to the ideal candidate to be the new CEO. And outside help helped. Hiring an outside consultant to help the nation’s second-largest credit union replace its longtime leader was an opportunity to do more than just hire his second-in-command. The process of selecting current CFO Mike Lord to succeed Jim Blaine as president and CEO of State Employees’ Credit Union ($33.8B, Raleigh, NC) on Sept. 1 also required reflection on the role of the CEO, the management team, and the board itself, said Cynthia Jolly, board chair for the 256-branch, 2.1 million member institution. 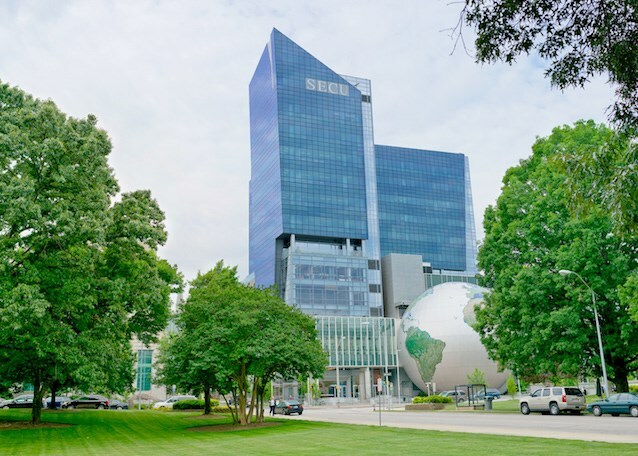 Jolly says the North Carolina-based Matthews, Young management consultancy helped the SECU board focus on what it was looking for: the right person to lead the credit union forward while helping to preserve the culture that got it to where it is today. “While the search firm was able to bring us examples of best practices across the industry and beyond, they also understood our culture, how we’re different in some respects, and they supported us in that part of our understanding of who we wanted to follow Jim,” Jolly says. Those differences include a flat organization chart, a single savings account, a single credit card, one loan rate for each product regardless of relationship, no sales incentives, and 256 branches, at least one in every county of the Tarheel State. Several locations also double as contact centers and SECU is now in the process of deploying a new system that corrals calls for service and routes them as much as possible to the member’s home branch. They also tend to be empowered to lead. SECU’s flat management structure includes multiple senior vice presidents who are themselves branch managers but also responsible for several others. They’re part of a large group of stakeholders in the CEO decision that Jolly and the board’s selection committee met with beginning about a year before Lord was selected. That series of discussions focused on finding out what was really working well at the credit union, future opportunities, and looming challenges, Jolly says. “Then, about a year ago we got a little more formal about it, because we knew we were nearing the time that Jim planned to retire. That’s when we began to engage even more seriously as a board and decided to use a search firm,” says Jolly, an educational consultant who herself works in organizational development. Jolly says Mathews, Young and its CEO, Tim O’Rourke, were a natural choice. The board knew him from prior work, including a planning retreat he had led last year, and as 2016 began the firm was formally charged with helping to identify Blaine’s successor. Begin early. “You really never know when you’re going to have to make a decision such as this, and hopefully it will be one that’s very well thought out and planned for,” Jolly says. Discuss and agree on the guiding principles and parameters for the process, including the attributes sought in the right candidate. In SECU’s case, that involved extensive committee discussion. Devote the time and resources to doing it right. Jolly says the search firm helped, of course, but so did a law firm that ensured the right processes were followed, including crafting a proper agreement laying out a clear picture of expectations and opportunities available to the new CEO. Be prepared for the process to take more time than expected. Mike Lord was an excellent choice to replace Jim Blaine, especially given where SECU wants to go over the next few years. Congratulations Mike, as well as the Board and staff of SECU. Thanks for your observation, Tim.